Thank you Rotary Club of Tucson! Thanks to the incredible generosity of Rotary Club of Tucson Foundation! Rotary Club of Tucson raised more than $1.2 million to benefit non-profit organizations through the 11th Annual Tucson Classics Car Show. Make Way for Books is honored to be the primary beneficiary of the Tucson Classics Car Show presented by Rotary Club of Tucson. 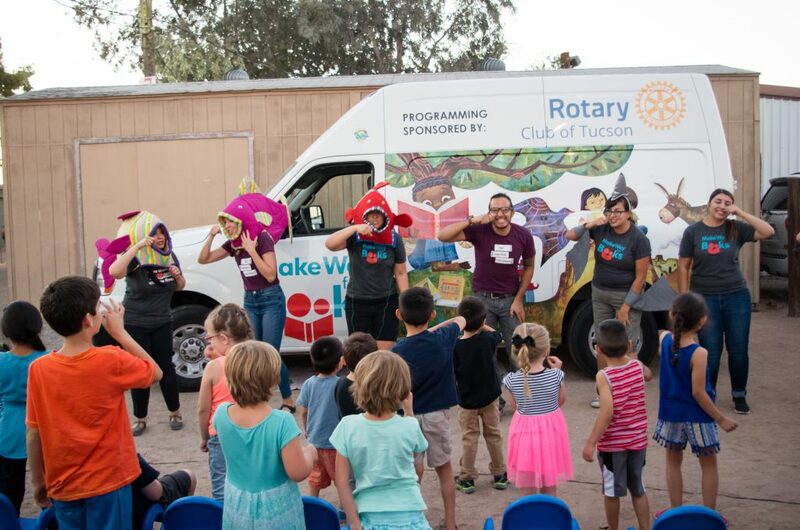 This year, Rotary Club of Tucson raised $74,300 to support our Cover to Cover “early literacy school without walls” program. Through Cover to Cover, we travel out into the community via book bus to provide quality early literacy programming and books to thousands of children and families. Cover to Cover is a two-generation change model which means that both children and parents learn together and develop skills. Week after week, children discover the joy of books while they develop critical early literacy, language, and social-emotional skills that ensure they thrive in the classroom and beyond. As a result of the program, 88% of families share more books and 96% of parents gain skills and confidence as their children’s first, best teacher! All of this impact is possible because of the incredible dedication and hard work of our local Rotary Club members! Thanks to Rotary Club of Tucson for helping us achieve our mission to give all children the chance to read and succeed! ← We are one of the first winners of a 2017 Great Nonprofits Top-Rated Award!